This was emailed to me by The Last Atlantean, I figure I'll post it here for the fans. 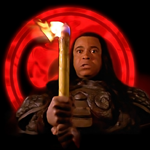 *I wonder why he made it a evil or vile association with Hephaestus for? It shouldve been Hades or Orcus no? Its more like a forge lair of Iron working it seems, like descent into Vulcan's volcano or something more than Pluto's bowels. The evil association could be related to the christian vision of the Underworld. Once you also noted, Cromulus, that Doom has a Tree behind his throne, were he also turns into a snake. Beside him lies Eve, tempted by the Devil and corrupted -also drugged, after eating the forbidden Apple-. That forbidden food could also be the human flesh. What's more taboo food than fingers and toes? In the christian myth the Devil was sent to the Earth by God, because the Devil wanted to become God. So he was punished. Then, the Devil wants to hurt and corrupt everything God created, in revenge. Maybe that's why Doom wants to destroy humanity? If the tomb where the mummy lies is really Atlantean in origin, then the giant king would have been the real ancient enemy of Doom. Now we can even think that giant is KULL. Anyway, I don't think there's really too many christian morality in the movie. Maybe the enemies are "evil" in some satanic flavour, but the main guys are far from being saints. God, Crom, and all the deities appear to be just tales for the children, in this world. As the father of Conan said, forget about gods, in the reality only exist men. Not giants, not god, just men. Yes, thats the likeliest explanation . Christian elements found in the movie, may though anger some fans,lol. He was associated with Typhon too. Interestingly Milius described Conan's pop as Vulcan, which is the italic equivalent of him. The two fathers, light and day, two faces, same coin. BTW, your new avatar is great! Do you have the whole picture? Yeah and the Tower of the Serpent music is from a Spanish Catholic mass. *No Turd, but I'll try and scan one for the site, its supposedly some rare Casaro alternate poster, lets hope he doesnt sue me/or us. Its an 11 x 17 on a hard cardboard, probably some movie theater or video store thing, an alternate from the USA one perhaps. Surprised Casaro doesnt publically show more of his CONAN, it seems he made a few alternates. The guy has like 12 of them for sale, so make sure you get yours. Yes it does, cept obviously the B&W color and the addition of the early rendition of the "CONAN" title. All we need now is the Volcano one. I think I will email this ebay guy, maybe he has one laying around. * I dont know yet whether by "cardstock" he means cardboard or just a regular poster paper. If he has that many, then its probably perhaps in digital. Oh well if thats the case then something is better than nothing I suppose. * On the bottom left hand corner, there appears to be some kinda writing, on Protoplasme's blowup of it. Oh, I totally missed the fact that he had 12 for sale. On the bottom left hand corner, there appears to be some kinda writing, on Protoplasme's blowup of it. The Volcano concept couldve been perhaps Thulsa Doom's lair, least the scriptwise one. I wonder if the half-naked Conan battling the giant snake with the axe was artistic license addition by Casaro or some early concept or more likely plucking from "The Gladiator" montage ? I was wondering the same about the serpent fight drawing, as all the rest of images looks pretty accurate to the movie. The Iron Master poster is amazing, I've only watched some clips of that peace of sheet in youtube, bu I could swear the poster is the only watchable thing related to that crap. Btw, the neandertals were actually picts. The poster arrived last Friday, it an 11 x 17, too big to scan on my machine here at home. The lettering does say Casaro, so its his sig there. The Conan illustration batting the giant serpent, looks taken from the Gladiator scene with perhaps some added flare. Yasmina and Doom look alot like Frazetta facial types, large cheek bones and oblique eyes. The poster is quite nice, hope others ordered them. Thanks again to Mighty! The Ironmaster poster is excellent, but wish that second caption in the lefthand corner was deleted and not there, as it kinda takes away from the overall scene. Excellent man, glad someone could get a quality scan for the rest of the fans. Amazing piece of art, really! If it wasn't for the snake part, which was probbaly done without photo references _ _ it almost looks better than the official one that they finally used. Though, didn't Casaro exaggerate a bit the princess's breasts? Thanks, Castor. Wonder if Casaro released a true movie print poster like that? here's my own transcription of the lyrics. i cant decide about a couple of the words, though. hope this helps, :) valete! 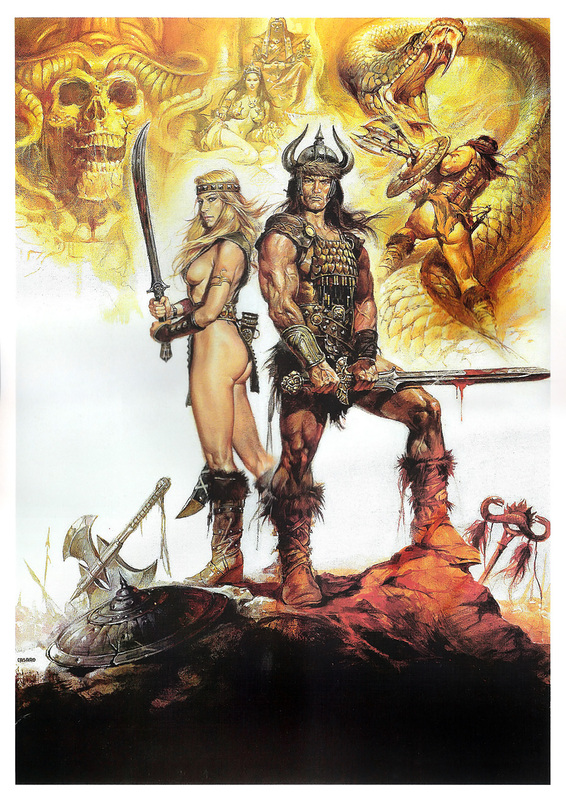 Does anyone have this third Conan poster showed by a memeber here in good quality JPEG ?